5 New Kids on the Block! 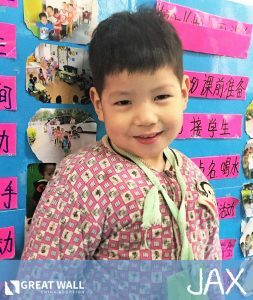 Jax is a precious little boy from China, who is 3 and a half years old. Jax is described as a gentle and introverted child who is generally happy. Jax likes to play with other children and enjoys spending time with his caregivers. His favorite activities are playing with building blocks and playing outside on the playground. Jax has been diagnosed with cerebral palsy and has received rehabilitation training that has helped him improve tremendously. He does still have some challenges, such as having hands that aren’t as flexible. He can hold a pen by himself and can scribble on a paper, but he cannot draw clear letters yet (of course, he is only 3 and a half, and most children that age are not yet writing clear letters). Jax can walk by himself, trot, and go up and down stairs all by himself. He is delayed on language and can only say a few words and short phrases such as “mom” and “give me.” He can also call the other children in the orphanage by name. He knows his own name and will turn when his name is called. With the proper medical care and therapies, there is no telling how much Jax could thrive! Jax needs a family to adopt him and bring him to America, so he can receive the proper treatment he needs. Will you be that family? If you would like to learn more about Jax, please contact the GWCA China Home Finding Team today! Click Here to Watch Jax’s Video! This amazing kiddo’s name is Ben! Ben is a sweet 10-year old boy in need of a forever family! Ben was hosted in the United States through GWCA’s hosting program for a month in summer of 2016. He had an amazing time while being hosted and bonded extremely well with his host family. Ben was born with very mild clubbed feet, but he has not needed any physical therapy or surgery to walk and run without assistance. He is very sociable and loves to say hello and thank you in English. He is on target developmentally and is a bright, intelligent kiddo. Ben is in regular school and is doing well. Ben is very active and outgoing and loves playing with other children! He loved playing with his host siblings and would make a fantastic brother. He is a sweet, fun-loving kiddo who would thrive with the love of a forever family! 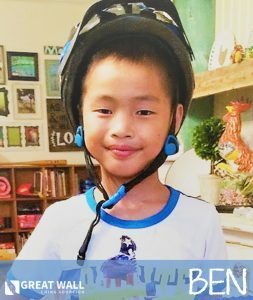 You can learn more about Ben by contacting the GWCA China Home Finding Team today! Click Here to Watch Ben’s NEW Video! This precious 1-year-old boy’s name is Zachary, and he is in need of a forever home! 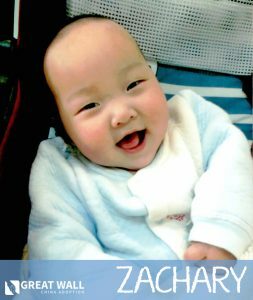 Zachary was born with protein dysplasia of the brain. Despite this need, he appears to be very active and engaged. He is a bright, happy boy who has excellent fine motor skills and the ability to roll over independently. He is very attached to his caregiver and loves to snuggle and laugh with her. He recognizes his name being called and is tracking items visually. Zachary loves to lay in the sun with the other kiddos and greatly enjoys being outside. He is described as being energetic and smiley! He would thrive with the love of a family. Please reach out to GWCA to learn more! This darling boy’s name is Jasper! He is 12-years old and is a healthy kiddo! 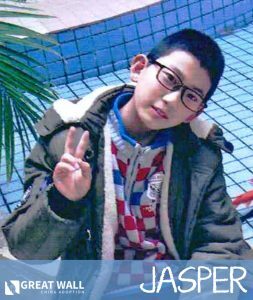 Jasper is a bright, extroverted, and friendly boy who loves his caregivers and the other children in the orphanage. He has excellent language development and appears to have met all developmental milestones. He is very independent and able to take care of himself and others. Jasper is in desperate need of finding his forever family before he ages out of the system at age 14. He is a smart, sweet child who would thrive with a family to call his own. Please reach out to GWCA to learn more! Lincoln is a sweet little boy that is 4 and a half years old. He is described by his caretakers as being very cooperative, smart, and cute. 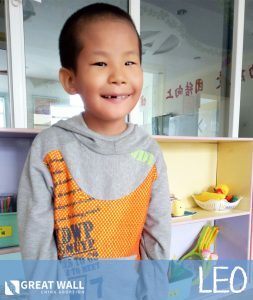 Lincoln gets along with other children, and he likes to play with them and do group activities. He can walk well on his own. Lincoln can speak and can sing full children’s songs. Also, he can hold a pen and scribble with it on paper. Lincoln is good at following directions and will often help his caretakers with their chores. Sometimes when he sees that his caretakers are tired, he will give them little back massages to help make them feel better. Lincoln has a congenital heart defect (CHD). He had a UCG (cardiac ultrasound) done on February 25, 2016 that showed he had mitral atresia, left ventricular dysplasia, truncus arteriosus, right heart enlargement, ASD (left to right shunt), two direction shunt of VSD (mainly left to right), and three tricuspid regurgitation. Because of the complexity of Lincoln’s heart condition, no more surgical procedures will be performed on him for the foreseeable future. He will probably never receive additional heart surgeries in China. 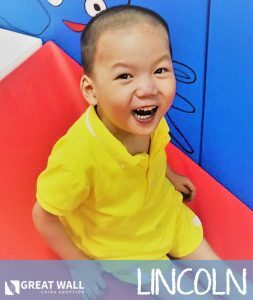 Most likely, the only chance Lincoln has to survive and have a healthy, happy life is if he is adopted by a family in the United States who can give him the medical care, love, and attention he needs. If you would like to learn more about Lincoln and see all of his new videos, please contact the GWCA China Home Finding Team today! Click Here to Watch One of Lincoln’s NEW Videos!